One year flies by so fast, too fast in my opinion. 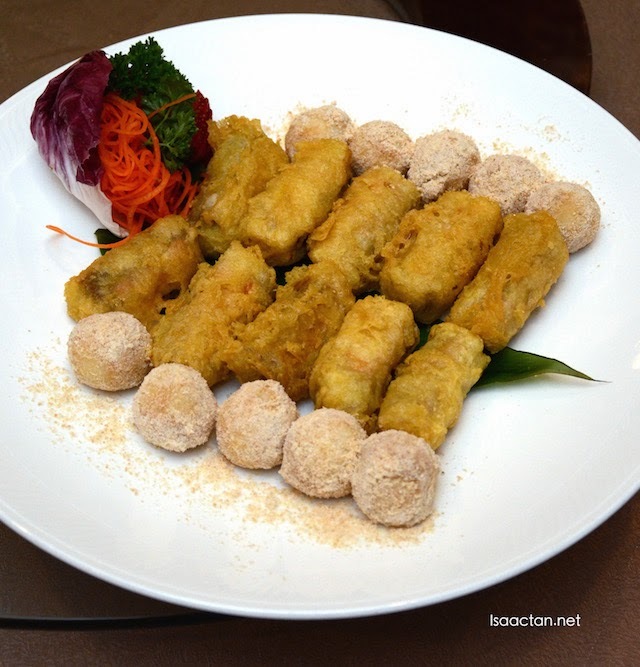 I still remember Chinese New Year last year like it was yesterday (Dorsett Grand Subang Chinese New Year 2014 Set Menu). Anyway this new lunar year of the wooden goat, do bring your loved ones and friends to Dorsett Grand Subang to celebrate the auspicious occasion with a variety of authentic food offerings at their chinese restaurant, The Emperor. Specially prepared for you to feast to greater success and prosperity all year round, at The Emperor, the hotel’s very experienced Executive Chef Loh Jiunn Voon and his team have whipped out more than 8 different Chinese New Year cuisines such as the Double-Boiled Cordyceps Flower with Dried Scallops and Black Chicken soup, Roasted Crispy Spring Chicken, Wok-Friend Tiger Prawns with Curry Leaf and Lemon Grass, the Chilled Almond Nut with Dried Pear and Aloe Vera and the must have Chinese New Year Salmon Yee Sang. 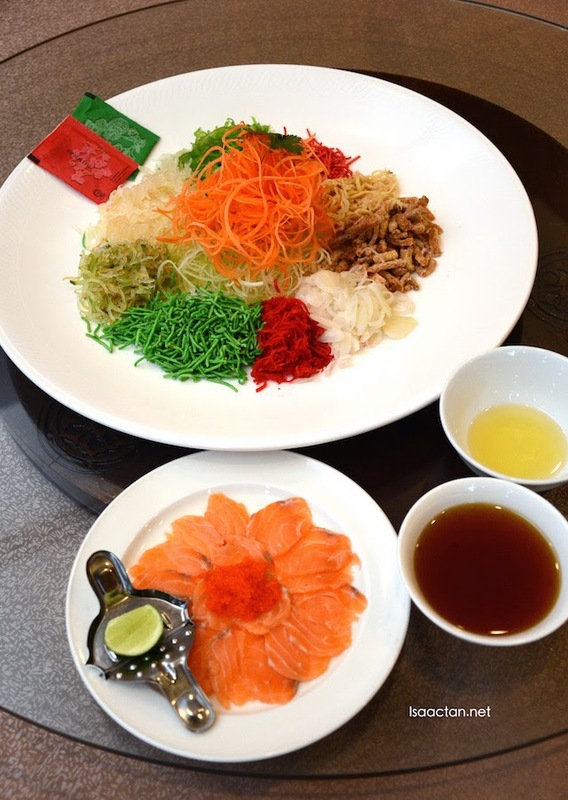 The Prosperity “Yee Sang” with Salmon Fish and Crispy Fish Fritters came with generous servings of salmon fish, and crispy fish fritters. 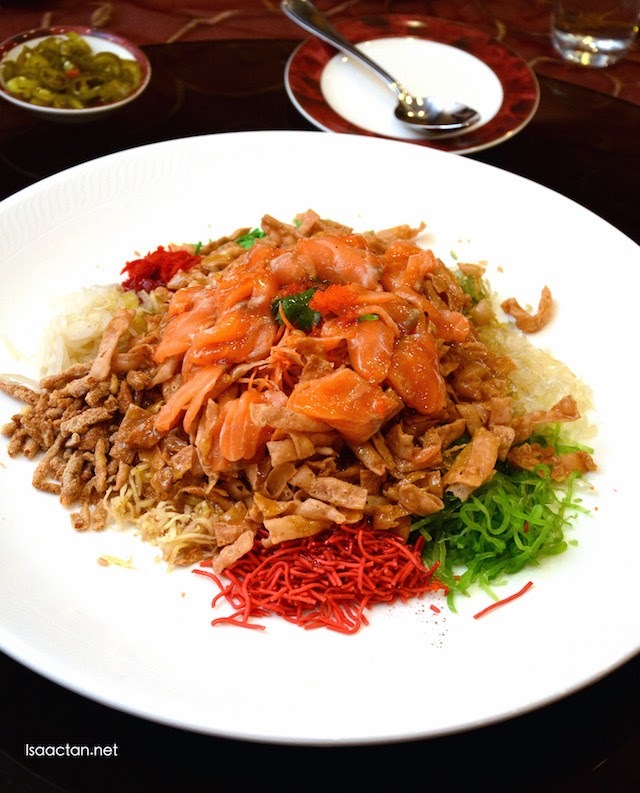 Topped with the sesame, pomelo and more, I do like the crunchy sourish sweet flavour of their yee sang. 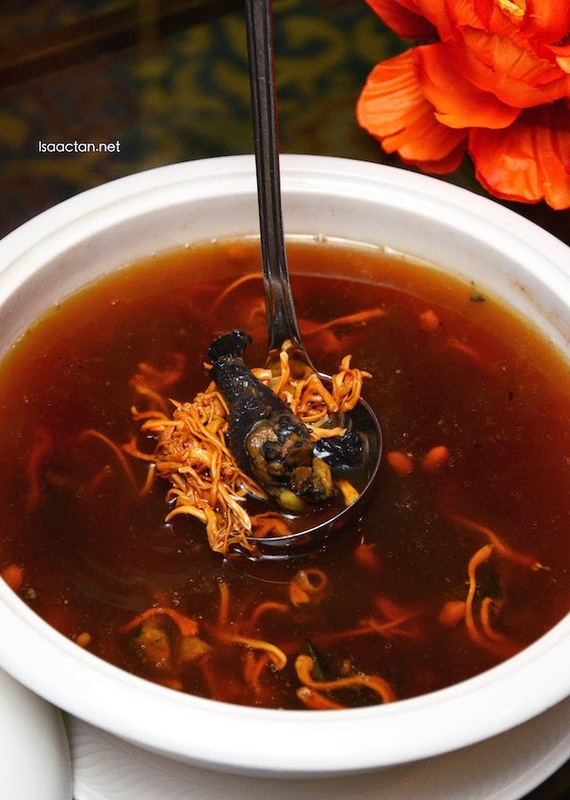 A rather exotic soup, the Double-Boiled Pitaya Yellow Flower with Dried Scallops and Black Chicken Soup came looking really thick. One sip, and you can actually feel all the goodness in one spoonful. I feel healthy already! The scallops increased its flavour, giving out that savoury taste to an otherwise slightly sweet soup. 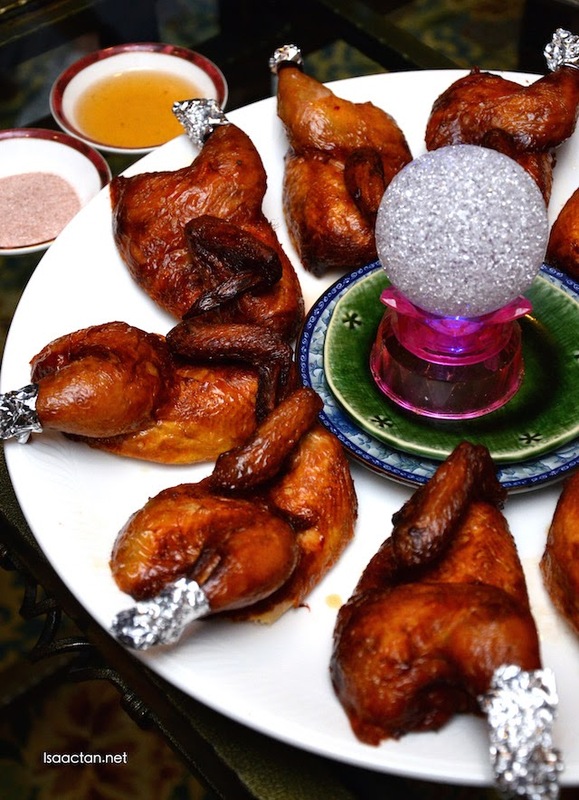 Poultry lovers would love the beautifully presented Roasted Crispy Chicken with Prawns Crackers. As if the chicken isn't crispy enough, you get to much on the prawn crackers too! Dip those delectable chicken into the accompanying plum sauce and plum powder, and you got yourself a very nice chicken dish. Love the crispy skin of the roasted chicken. 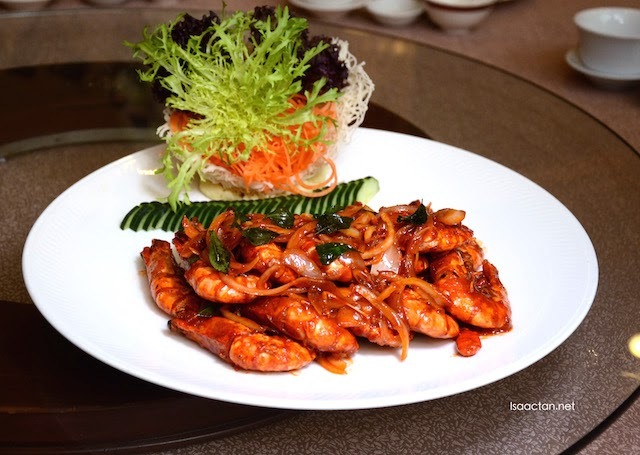 The Creamy Buttered Prawn with Cili Padi came in some spicy goodness, with the prawns being rather fresh. I really dislike prawns which have their skin stuck like UHU to the meat, and thankfully here, it peeled off rather easily. Coated with aromatic lavours, a pretty good dish to pair with the fish after this. 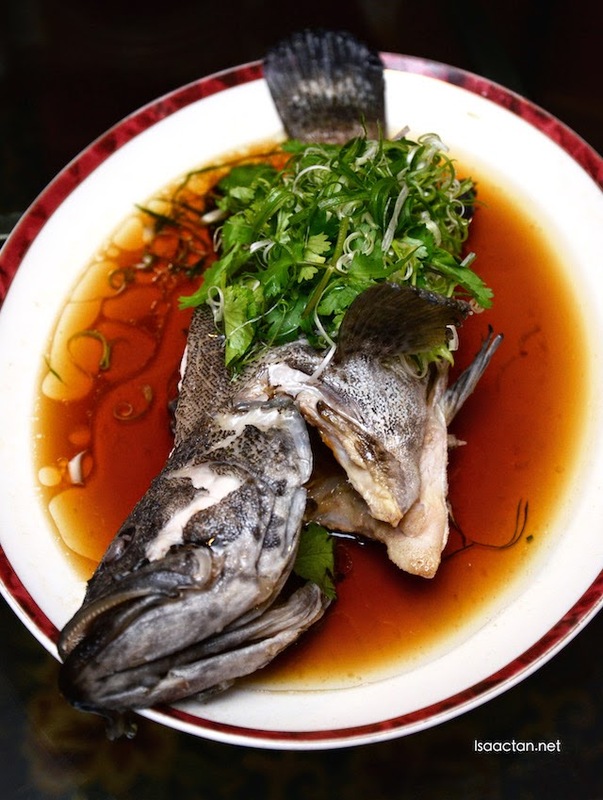 The Fresh Steamed Red Snapper with Golden Garlic and Superior Soy Sauce is served hot from the kitchen. 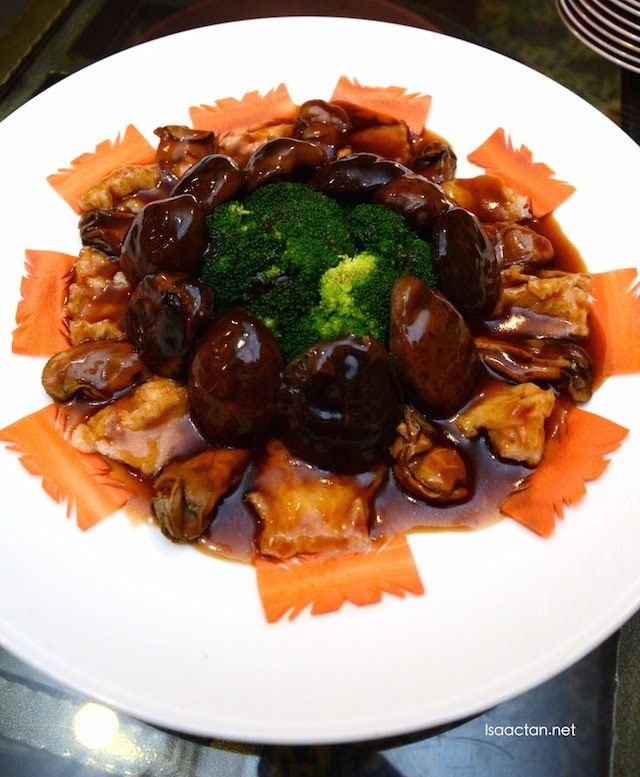 With soft fish meat, it went really well with the soy sauce. Even for one who is not a seafood lover, I could learn to appreciate the tastiness of this dish. 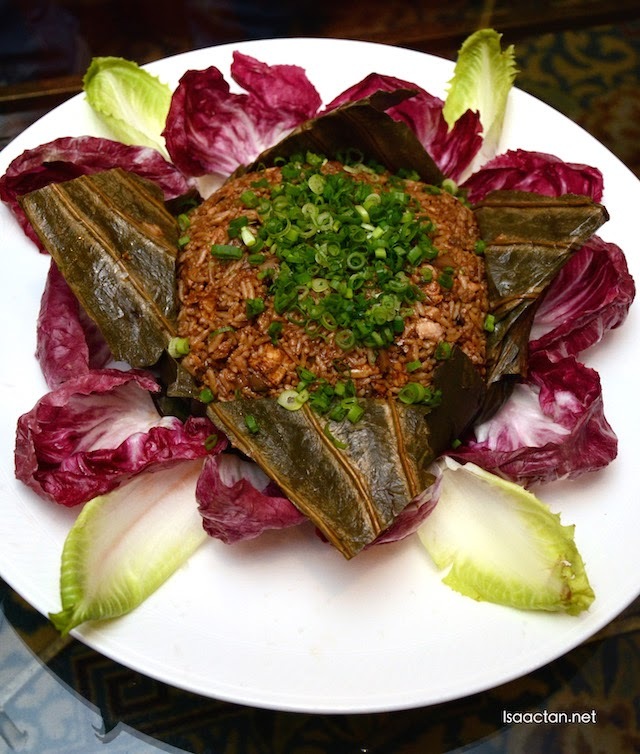 If you're not yet full from the previous dishes, then stuff yourself silly with the subsequent sea cucumber, broccoli and dried oyster sensation and Glutinous Rice with the Assorted Preserved Meat in Lotus Leaf. Personally, I did not prefer their glutinous rice as it sort of lacked that moist texture, feeling too dry instead. The mushrooms and broccoli were pretty good though, but I do not really take oysters. We ended our rather hearty meal at Dorsett Grand Subang with some sweet dessert in the form of the Deep-Fried Chinese New Year Cake with Glutinous Dumpling “Shanghai” Style. Sweet and sticky nian gao wrapped with yam and sweet potato, deep fried till a golden crips. Good stuff, one is never enough. On the side, we had the black sesame glutinous dumpling. For enquiries or reservation, do contact Dorsett Grand Subang at 03-50316060 ext 1954, or check out their website at www.dorsetthotels.com/malaysia/subang. This Chinese New Year, The Emperor Chinese Restaurant Dorsett Grand Subang is offering unique sets of goodwill dishes for a table of 10 ranging from a price of RM988++ per table to RM1588++ per table. I like that thing to squeeze the lime. I wonder if I can find that here. Ummm...you have my mailing address. Wink! Wink!